Building with shipping containers? – Containers First’s entry in last season’s V8 Supercars Championship may not have set any new track records, but it was definitely fast. 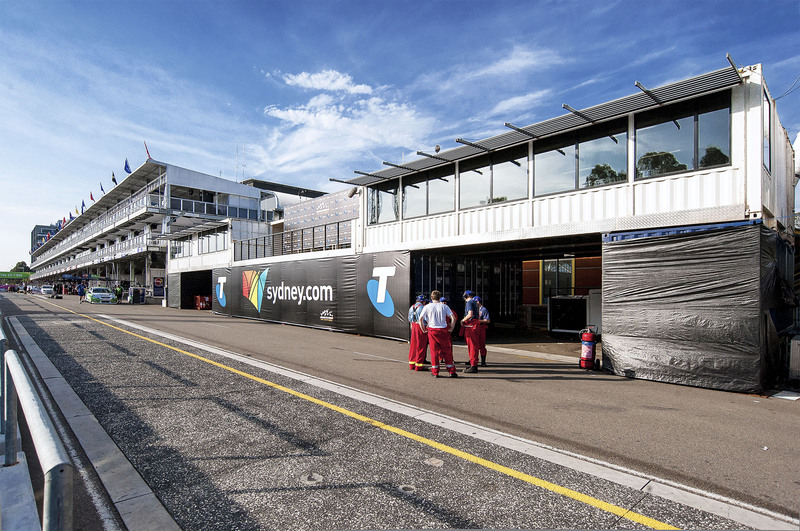 The Sydney-based shipping container supplier installed temporary Media & Race Control buildings constructed entirely out of steel shipping containers for the popular motorsport’s year-end finale at the Telstra 500 Homebush Street Circuit in Olympic Park precinct – all in just two days. 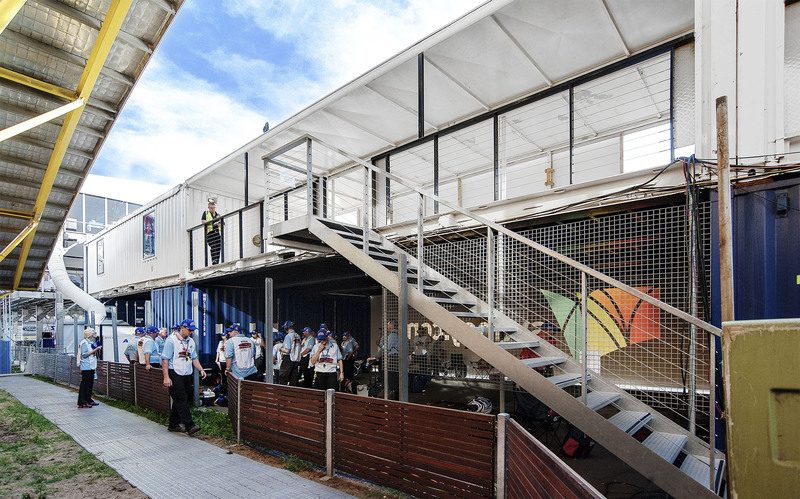 Whilst 30-odd V8 Supercars roared past pit straight along Australia Avenue in 40ºC heat at over 200km/h, just a few metres from the track Container First’s elevated installation, complete with air conditioning and 3-phase power kept broadcast commentators, Channel 7 technicians, race officials, and tonnes of high-tech equipment cool and comfortable. Containers First used 12 regular 10-foot shipping containers to create the buildings’ foundation, and 9 modified 40-foot shipping containers were hoisted on top to house the media in one section and race personnel in another area. The installation also included an upper-level finishing podium spanning the two buildings. 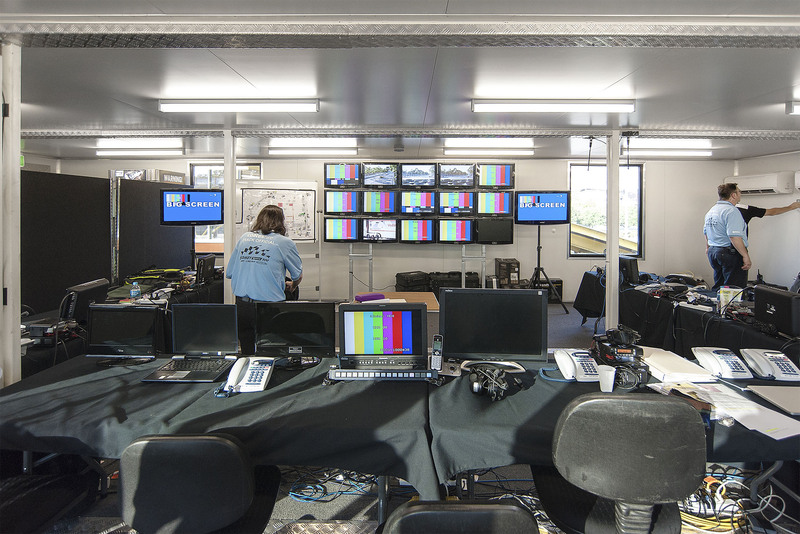 The installation provided an exceptional view of the pit straight through tinted and double-glazed glass windows with protective awnings, whilst the climate control and sound dampening materials allowed occupants to supervise and broadcast the three-day event in cool comfort. The media and control centres complex was located between two grandstands (which took eight weeks to install) to accommodate some of the estimated 170,000 people who attended the event. 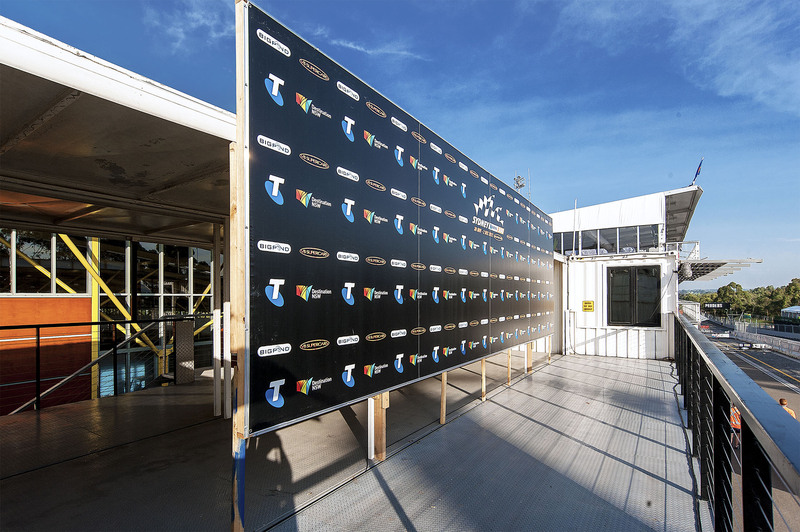 Because the Homebush race is a temporary circuit, Containers First modular installation provided a fast and economical solution for race organisers and the NSW government. Following the race, the buildings were dismantled, loaded and hauled away by a three-man crew – all in less than a day. When not in use, the modified upper level buildings are stored at Container First’s facilities in South Strathfield, whilst the lower supporting units were placed back into company’s general inventory.